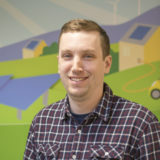 In 2018, after 2 years in the solar industry, Gus joined the SunCommon community. He has lived in Vermont all of his life, and could not think of a better place to raise his 1 year old baby girl. Has has a passion for music, art, photography, and snowboarding. The environment and conservation have always been important to him and a career in solar is the perfect way to help preserve this beautiful state he calls home.